Bytes decided he was in the mood for Grandma Call’s No Bake Chocolate Oatmeal Cookies. Deep chocolate flavor, textured with oats and coconut, those cookies were a favorite of his. And of Grandma’s thirteen other grandkids who wandered through her kitchen. She always had some goodie tucked away for their visits and this was a frequent flier! When the clink of the cookie jar lid was heard from the kitchen, it was usually a taller grandchild helping themselves and a cousin. Too close to dinnertime and Grandma would peer around the corner into the kitchen and warn the red handed cookie holder that mealtime was imminent. But if timed right, she would pretend she didn’t hear a thing and the pilferer was home free. For one of her birthdays, the family compiled a book of Grandma’s classic recipes, including this one. One commenter noted this was a “surprise” recipe – Grandma would omit the coconut if she was out, or add raisins or a bit of cereal of whatever kind needed to be “used up so it wouldn’t go to waste.” Another noted that this was most frequently made on Sunday afternoons for the coming week. If one or two grandkids were visiting, they got to help make the cookies. Cooking with Grandma was an especially “special treat”! The original recipe, in Grandma’s small, hurried but precise handwriting, is still floating around. I haven’t seen it, but I’ll bet it was written on the back of an envelope! She was a child of the Great Depression and everything was repurposed. Including the waxed paper lining from the cereal boxes that she saved to line the cookie sheets where the no-bake cookies cooled. Use a medium heat for cooking the chocolate syrup. If heated too quickly or too hot, the sugar will crystallize and the cookies will be crumbly. Stir constantly while mixture is boiling for the same reason — to keep the sugar from crystallizing. (It’s only two minutes but hands and arms get hot with a short spoon even when the heat is turned to medium! See wooden spoon tip in the recipe –) Adding the chocolate mixture into the oatmeal and coconut needs to be done quickly or the mixture will begin to set up. Keep a bit of milk close at hand, because sometimes that is necessary to keep the mixture moist enough to drop onto the paper. Line two large cookie sheets (or the countertop) with waxed or parchment paper or non-stick aluminum foil with non-stick side up. (Cereal box liner paper optional.) Use an small scoop and roughly level off the top to make cookies of a more consistent size and shape. Bytes has mastered the skills required. The cookies disappeared in less than two days. The ones he shared with friends brought a request for the recipe. Here it is – and you get to share in this classic too! 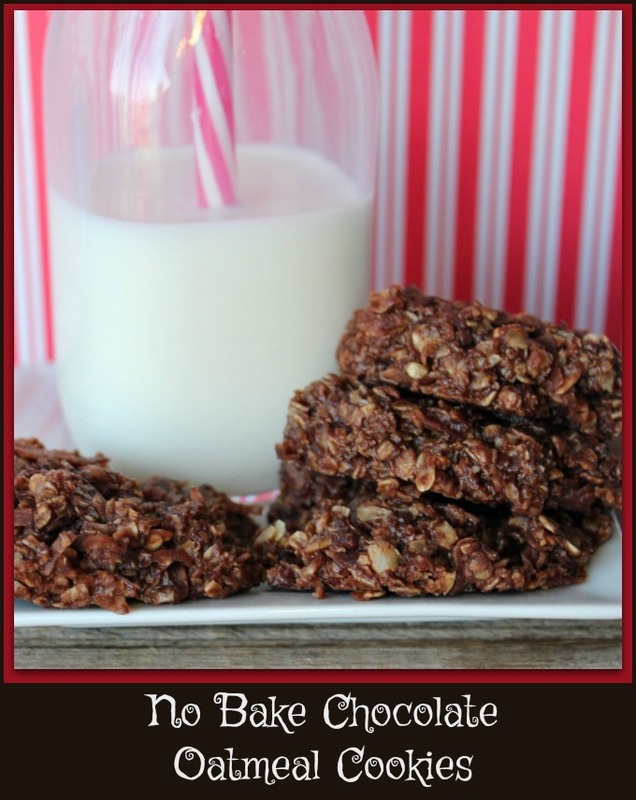 Chocolate No-Bake Oatmeal Cookies Recipe Type : Cookie Author: A Pinch of Joy by Charlene Vance THE classic no bake chocolate cookie! It tastes just as good as you remember -- or even better. Make it a tradition for you and your family. Measure oatmeal and coconut and mix together in large container. Place waxed or parchment paper or non-stick foil on two large cookie sheets or counter ready for cookies. Stir together, sugar, cocoa and milk in large saucepan over medium heat. When well mixed, add butter. Butter will melt as the mixture heats. Bring mixture to boil, stirring frequently. Boil for two minutes over MEDIUM heat, stirring constantly with long handled wooden spoon. Turn off heat and add vanilla. Pour over oatmeal and coconut mixture and stir everything together quickly with wooden spoon. Drop by tablespoonful onto prepared paper. Cookies will harden as they cool. Yield: 4 -5 dozen depending on size.